Not Crowded. 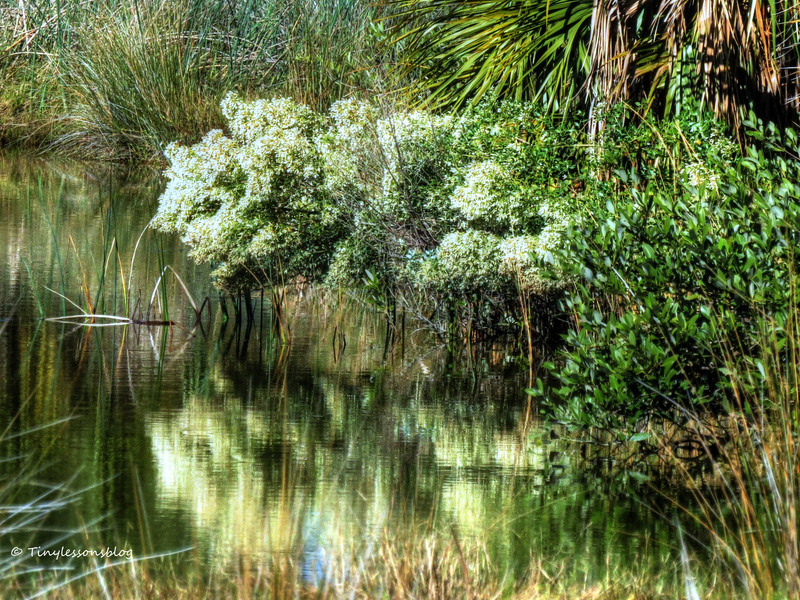 After Thanksgiving in the Salt Marsh. After neglecting my exercise routine for almost a month, and eating far too much over the holiday, I decided it was time to get out. Not to the malls or other crowded venues offering black stuff for mere pittance, but to the salt marsh to check on my feathered friends. The weather was finally sunny and the strong winds had calmed down quite a bit. 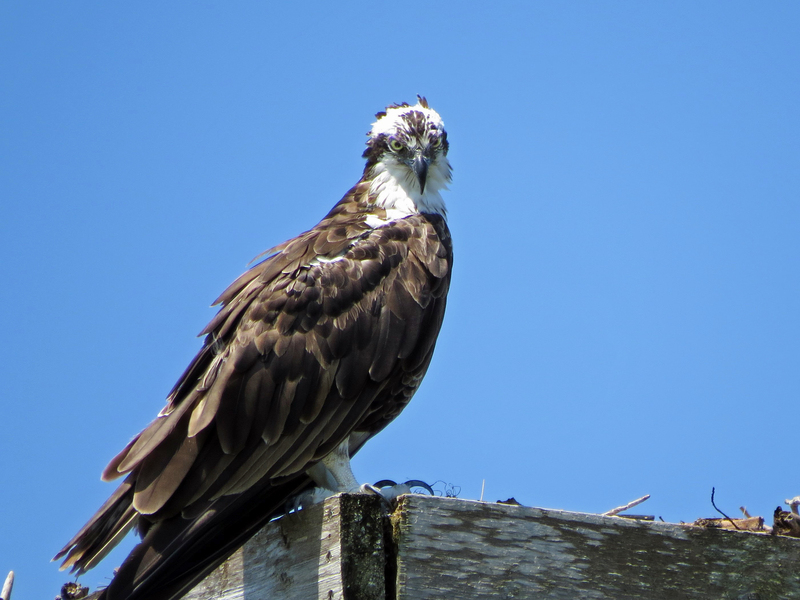 I was eager to see how the residents had fared the stormy weather and whether or not Papa Osprey would still recognize me. 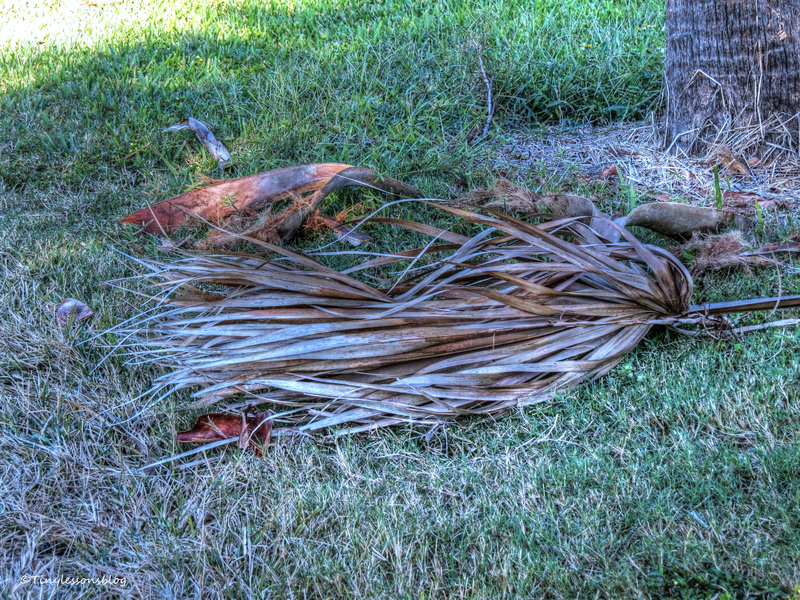 There we signs of minor wind damage, dead palm branches and small debris scattered everywhere. And very few birds out and about. I almost got worried. 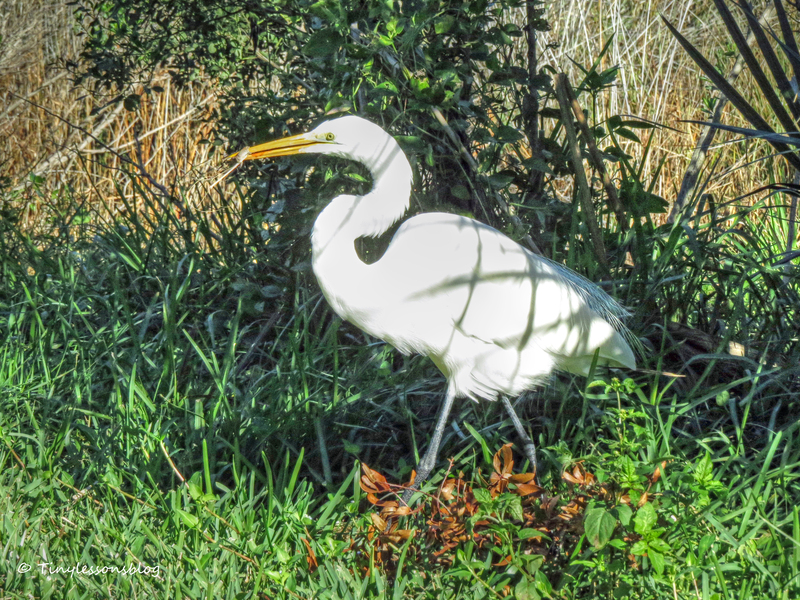 But then I spotted this Great Egret. He was hunting. 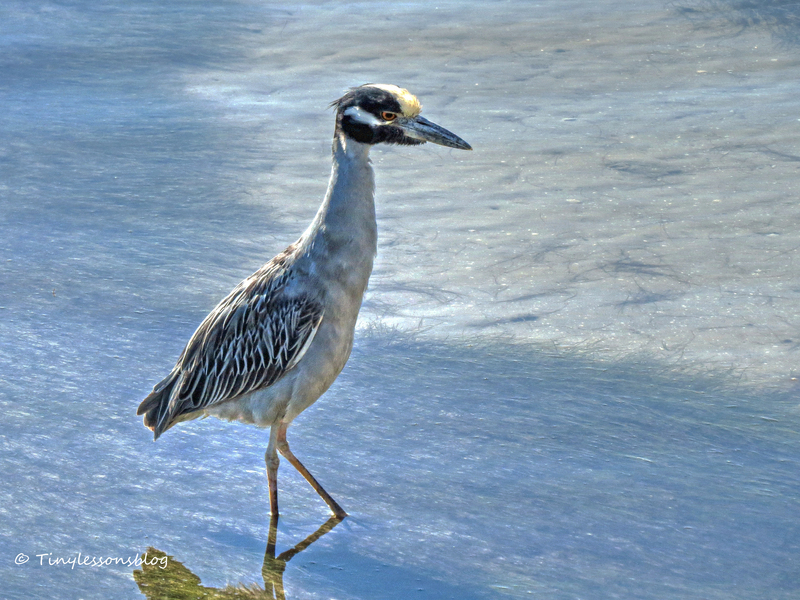 Looking intently into the grassy pool of water, waiting patiently, and then making his move. He caught a little frog (click to enlarge, and you’ll see). 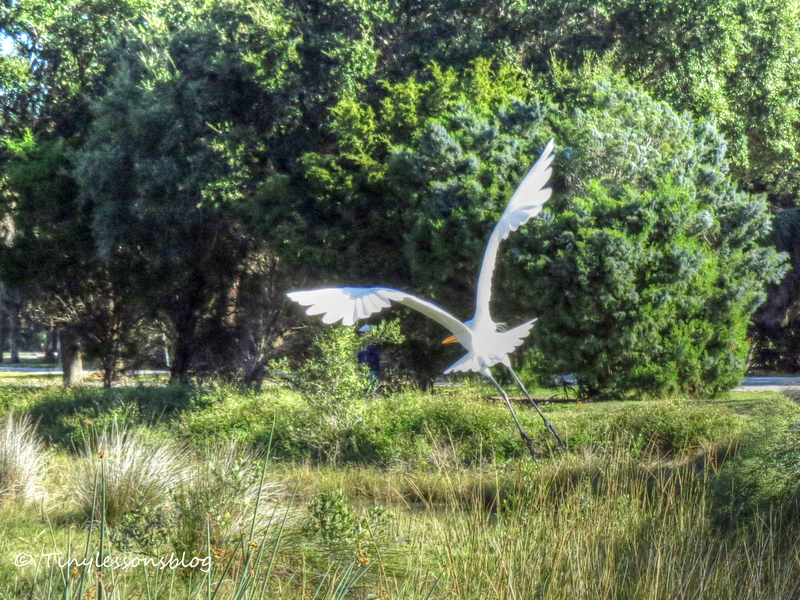 He ate it and flew away to the sunny side of the marsh. I continued to Papa’s nest. 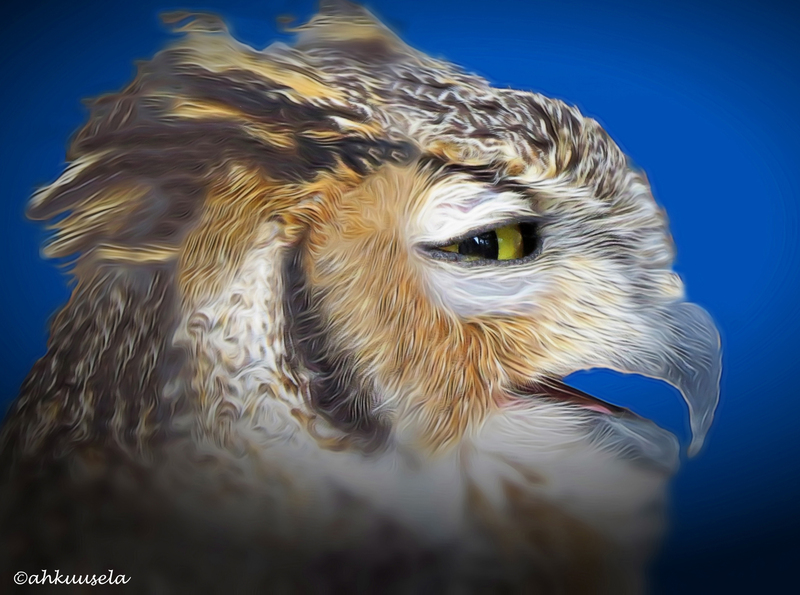 He was there, initially awake and checking his surroundings. But he had a full crop, much like mine after the holiday. He was sleepy. 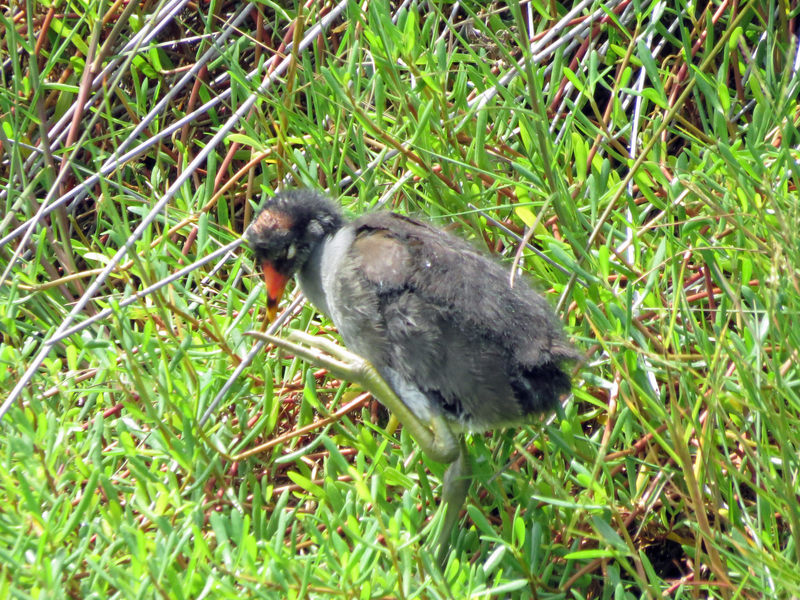 After nodding a greeting, he soon fell asleep perching on the edge of his nest to digest his breakfast. I thought that was neat. Tiny was not a threat, it was okay to doze off. He looked cute sleeping like a baby, I thought. I let him sleep and walked around for a while looking for more birds. 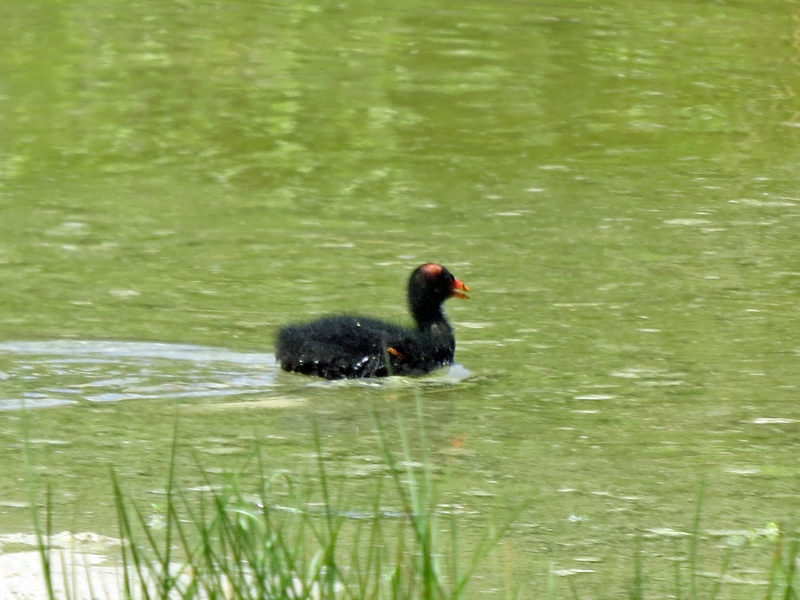 I found the Moorhen family, all three together, on an after breakfast swim. 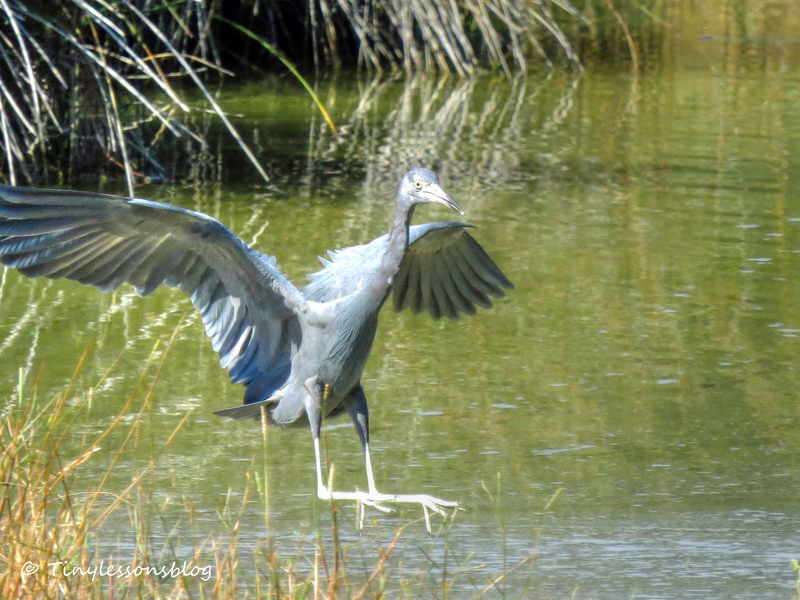 And whoops, suddenly a Little Blue Heron landed almost in front of me. I assume he’d been away for Thanksgiving. Welcome home you little one! But all the others were still sleeping, hiding or just away somewhere. So I decided to walk to the bay side to look for more familiar faces. But the pickings were slim. 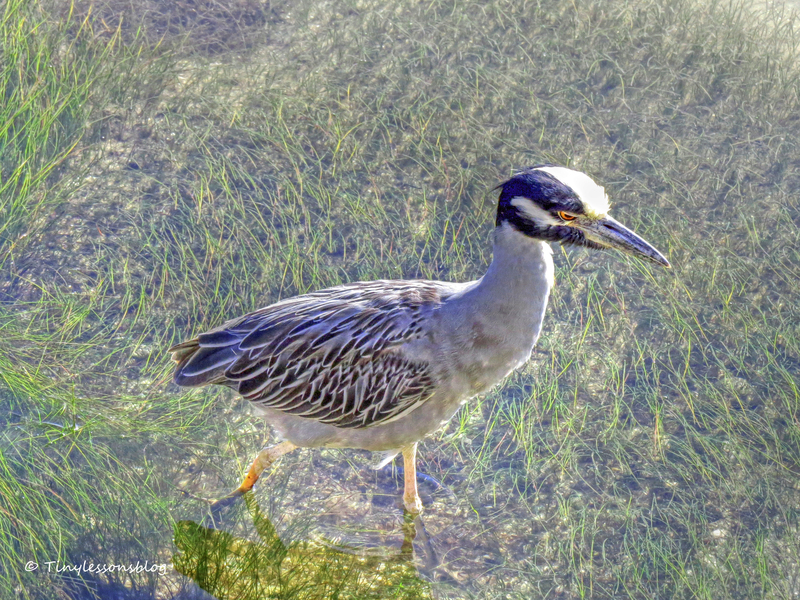 To my delight I spotted at least one resident of the salt marsh, a Yellow-crowned Night Heron. That was rare as they usually don’t hunt after daybreak. I always find them dozing off in the bushes, but not this one. I hope he wasn’t sleepwalking. …walks in the shallow water of the bay. Gen Z Invasion. In the Nature Reserve. I haven’t had the time to take a walk for quite a few days, so I started feeling the deficit today. You know, like an itch in the soul and tingling in the toes. I knew that a long walk on the beach and in the nature reserve would provide a complete cure. So that’s what I did. 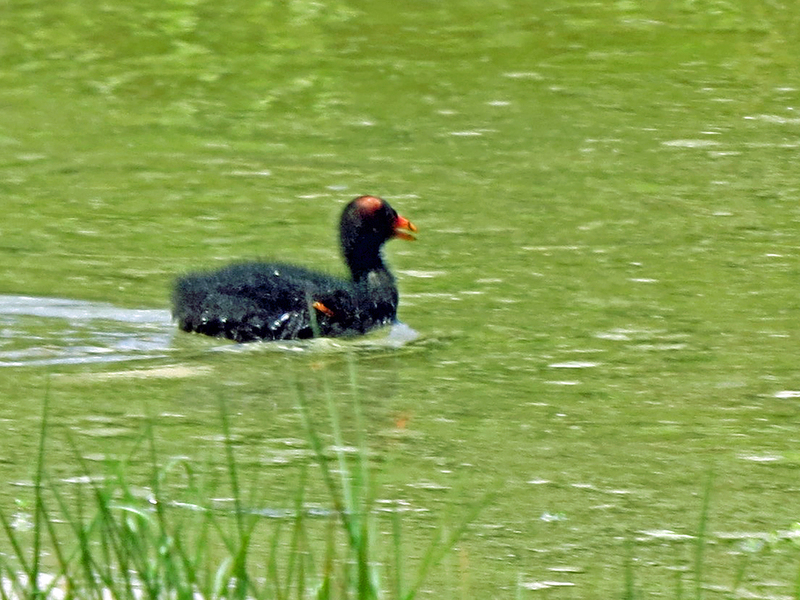 Arriving in the nature reserve, I discovered that the Gallinule kids had grown up in the last one month, transformed from fluffy black fur balls to beautiful teenagers. 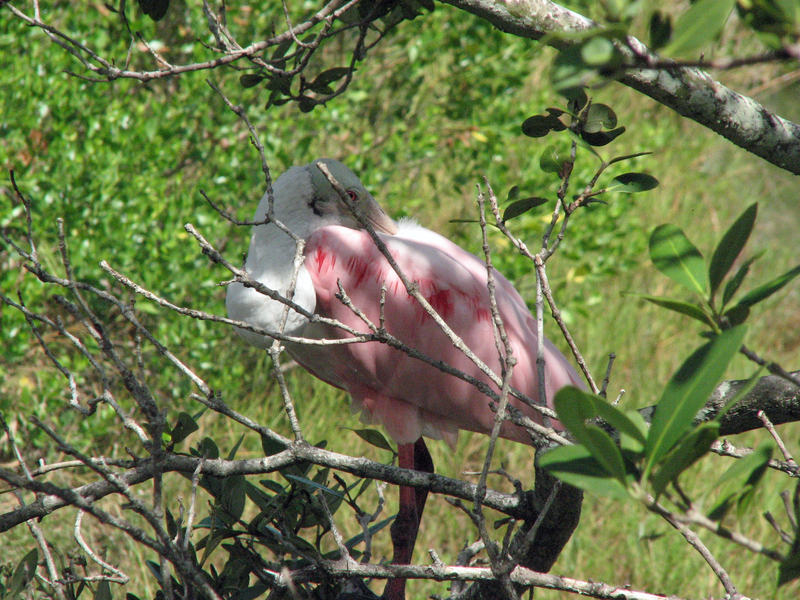 Walking a bit further, I found a young roseate spoonbill. She was sleeping in the shadow of a tree and woke up when I approached her “bed”. She gave me the look. You’re waking me up and it’s not yet even noon. 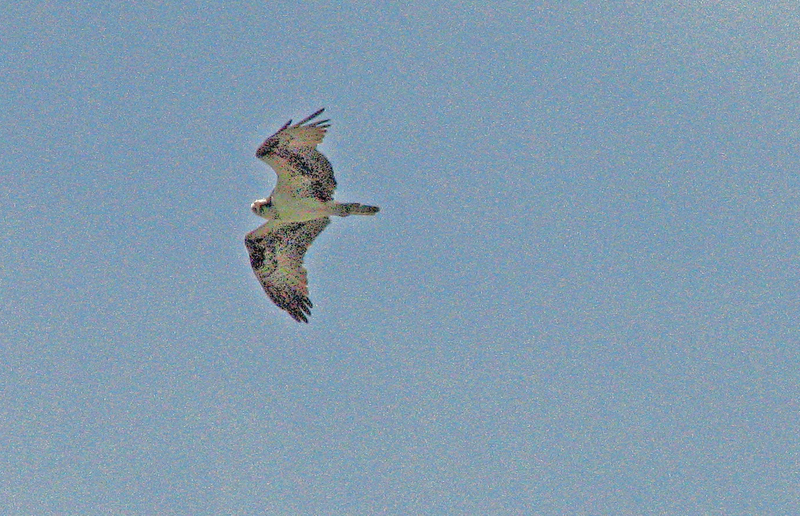 Then to my total surprise, the young osprey came to say hello. 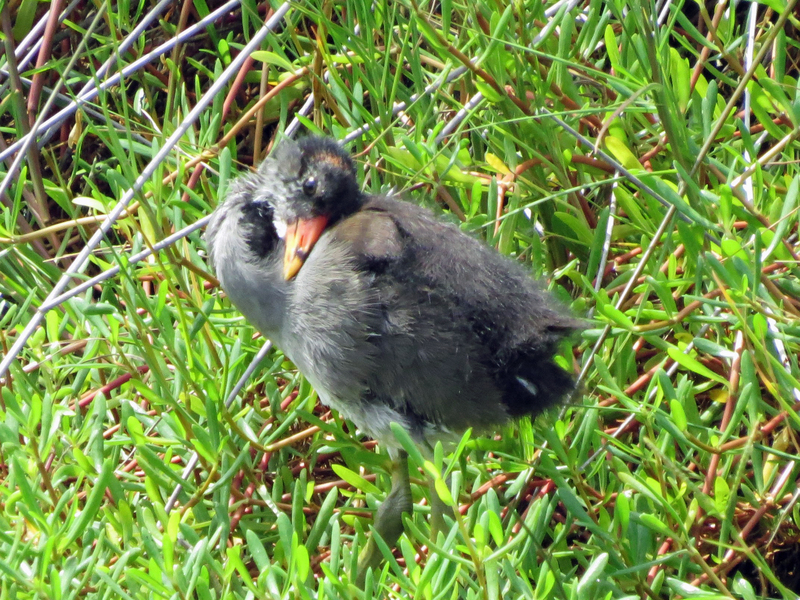 She’s been hanging around on the bay-side (across the street from the park) after she left the nest about three weeks ago. 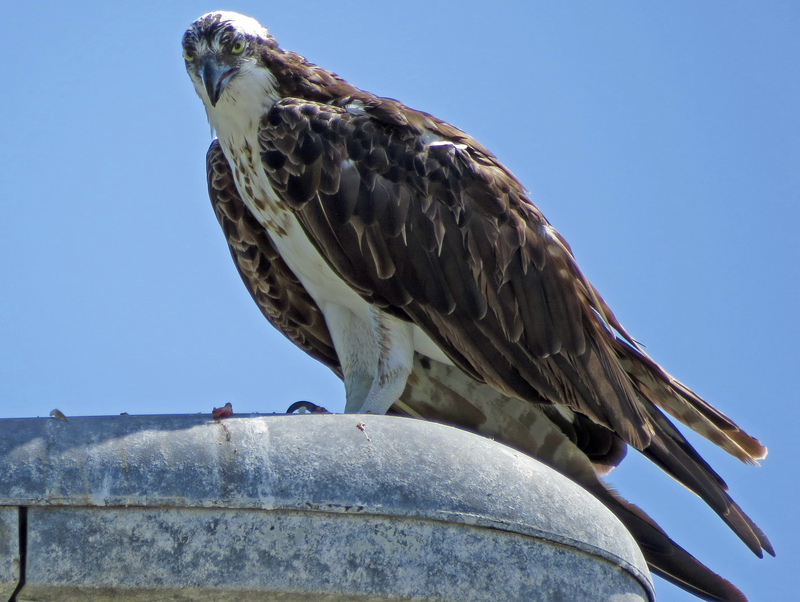 Thanks to excellent binoculars I’ve seen her fishing on the bay and then eating the fish on her favorite lamp-post at the sailing club. 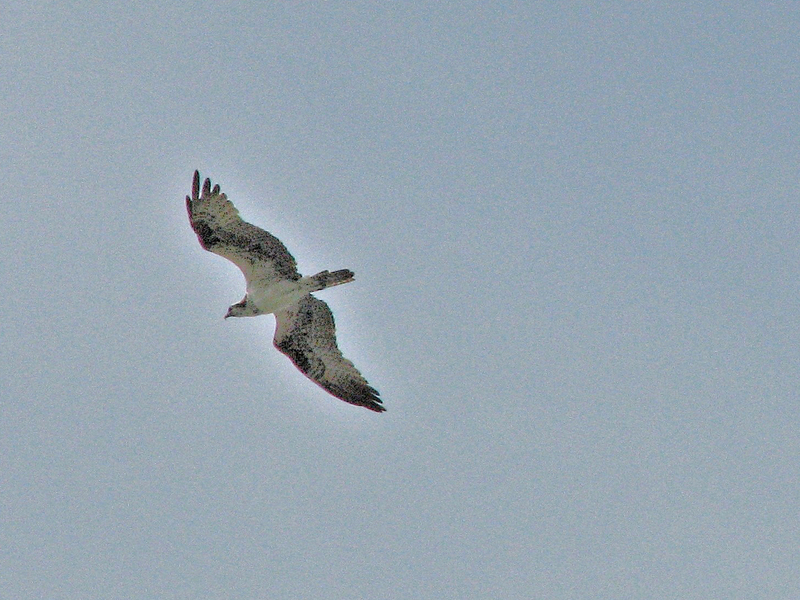 Now she flew right over her birth home, fairly high up, and looked down on me. Sorry for the bad quality of the pictures, but she didn’t send me a text that she was coming 🙂 It was great to see her again “in person”, even if very briefly! There were so many gen Zs in the reserve today, they far outnumbered all the other generations. 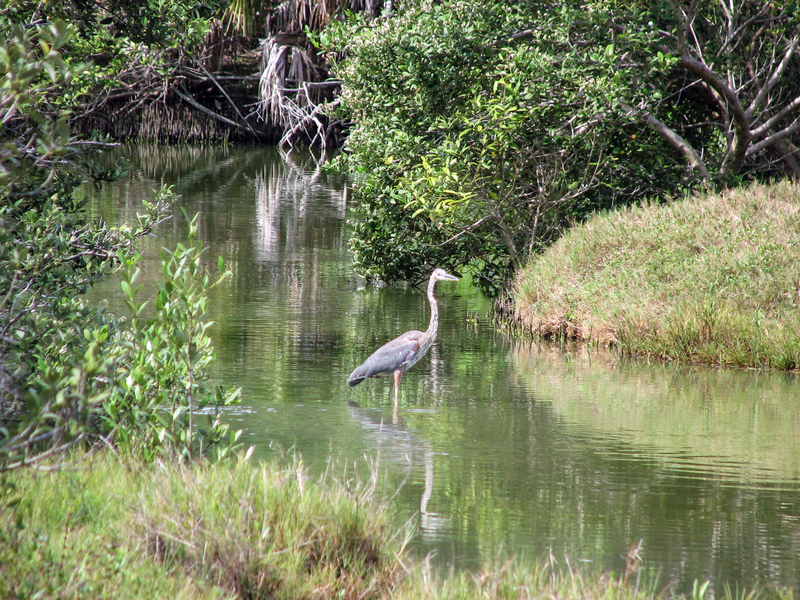 Next, I saw the resident great blue heron patrolling the marsh. He’s a mature adult, a boomer like me. 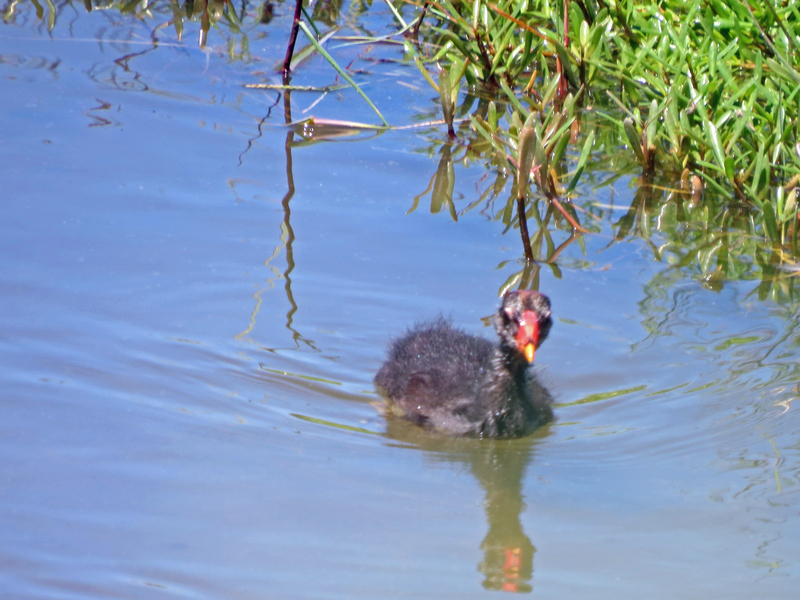 I bet he’s the Mayor of the marsh. Always there, always in control. 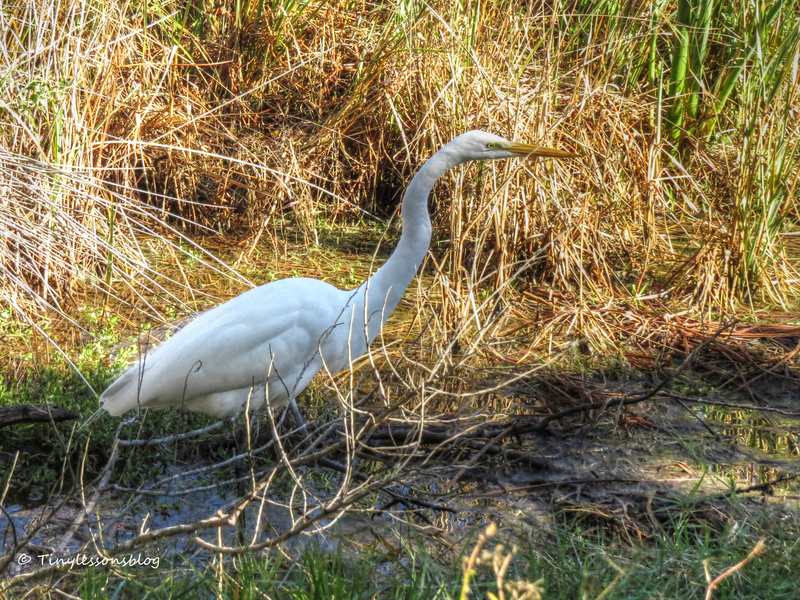 There were several other herons present in his municipality. 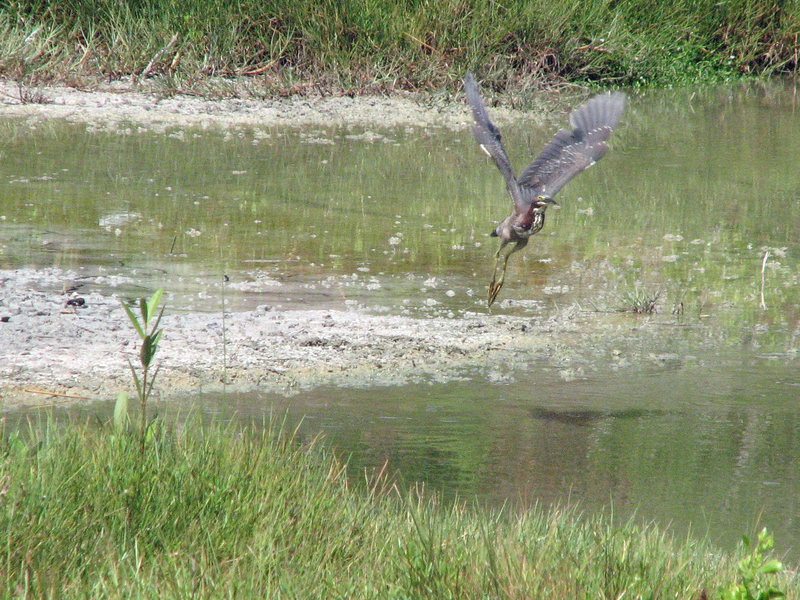 I saw the green heron again. He was taxing out on the sand dune and then took off. 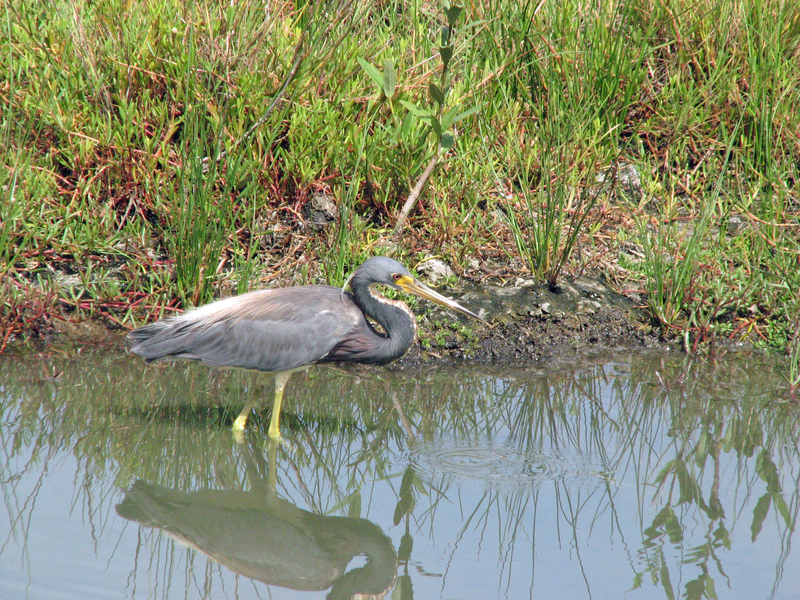 Before I left the reserve, I spotted a tri-colored heron. She’s such a beautiful and gracious bird. And a great fisher too. I’m quite sure the night heron was there too. 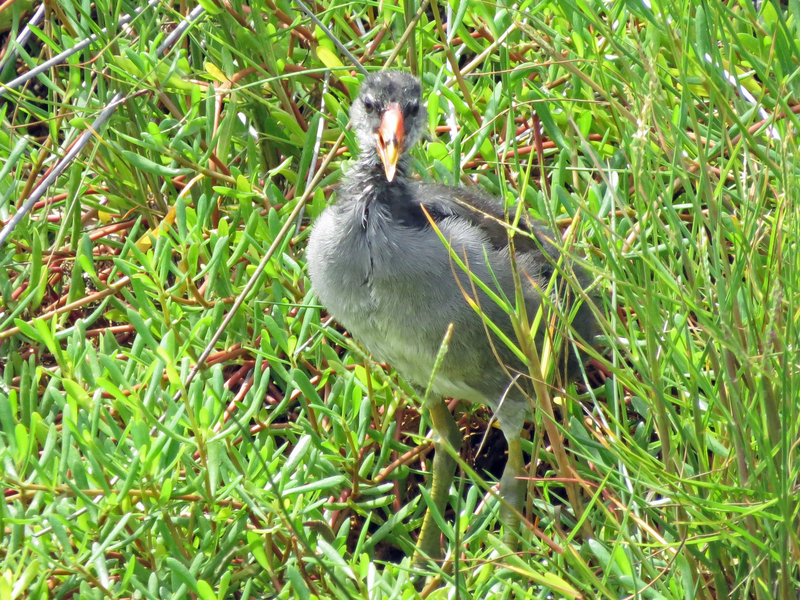 He’s always hiding in the bushes around the marsh and very difficult to spot. Anyway, I hope you enjoyed the walk, whether gen x, y, z or an older version like me. Have a great week. 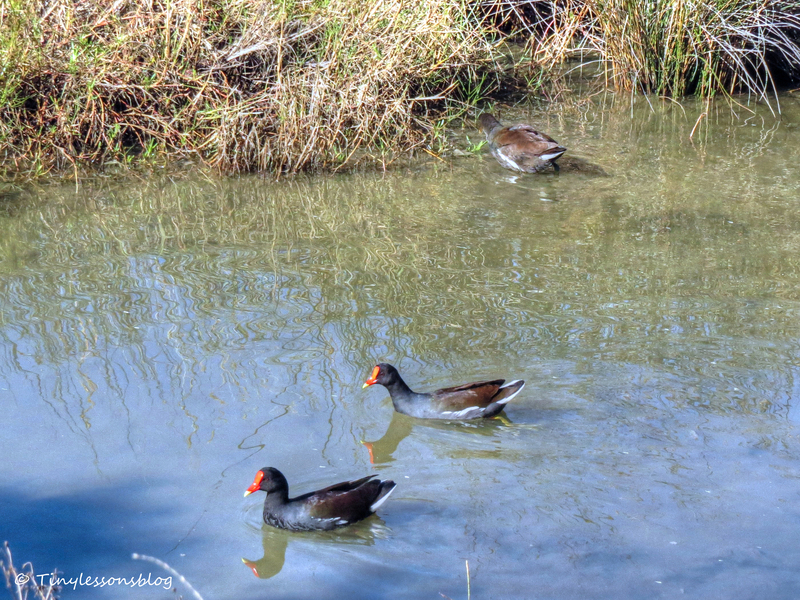 The Gallinule Kids. 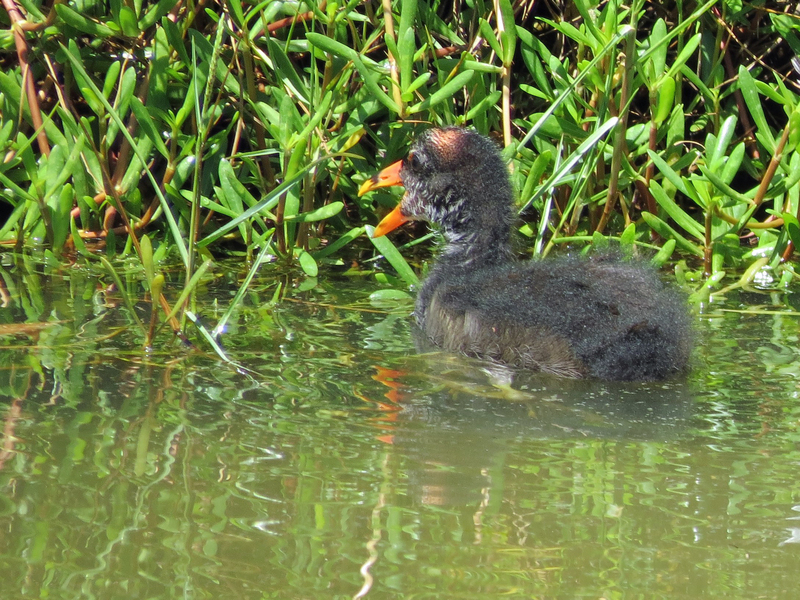 And Another Juvenile. Yesterday, for the fist time in more than a week, I was able to take a walk in the nature reserve. 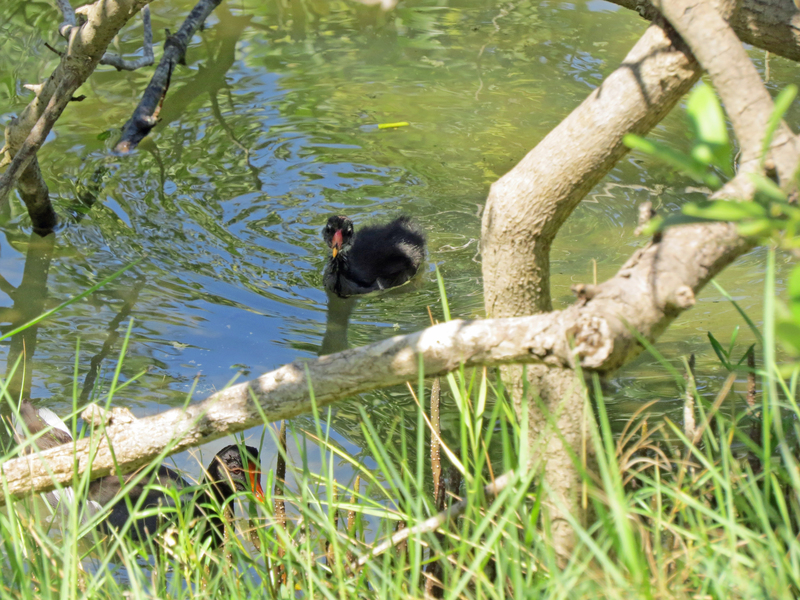 I was delighted to find the Gallinule family, mom and all three kids. Fluffy black balls with red sprinkles. 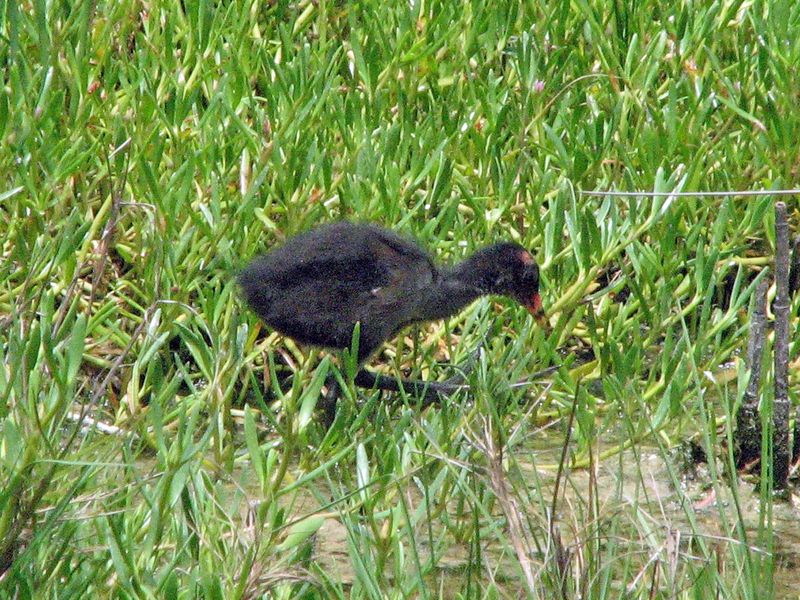 Mrs. Gallinule is extremely skilful in hiding her chicks even when they are on the move, but a little movement under bushes and grass next to the water gave her away. 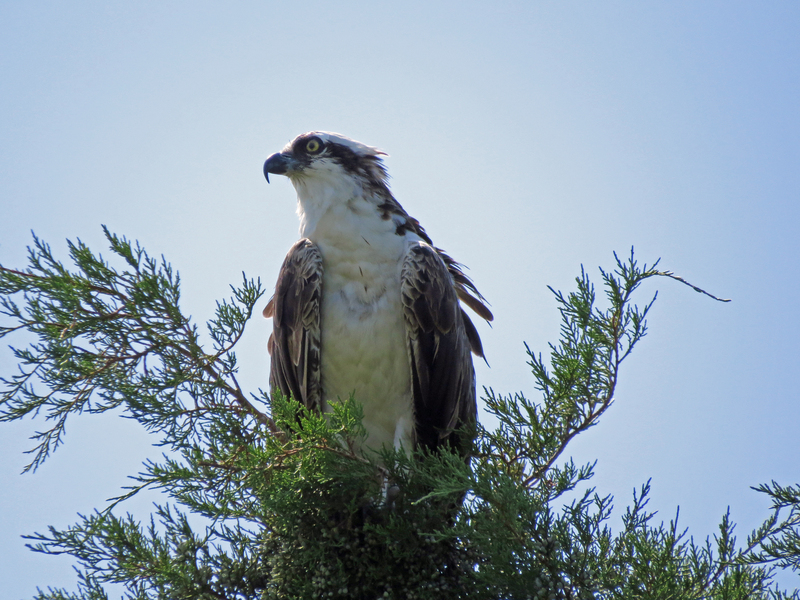 While in the park, I also had to check on the osprey nest. I found the juvenile there alone. 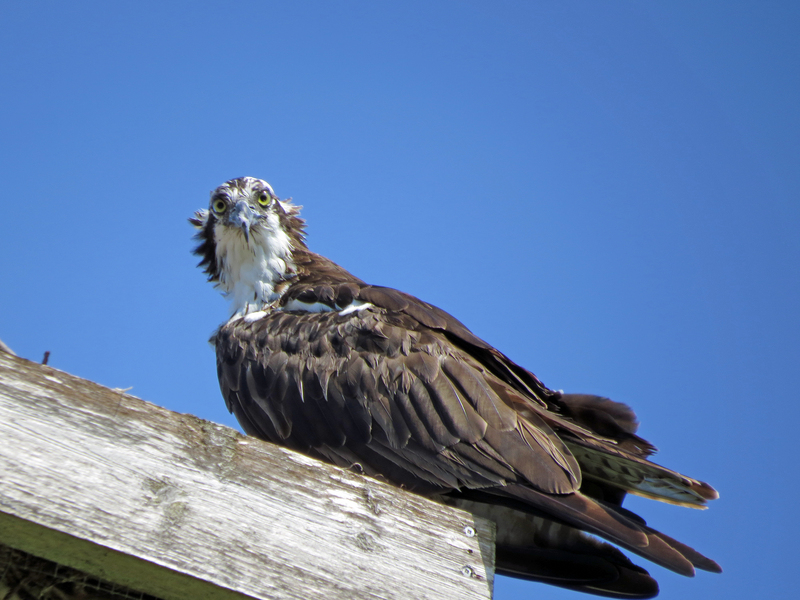 She looks more and more like an adult now as the white feathering on her wings is becoming less marked. She was having brunch, fish that she’d caught by herself. 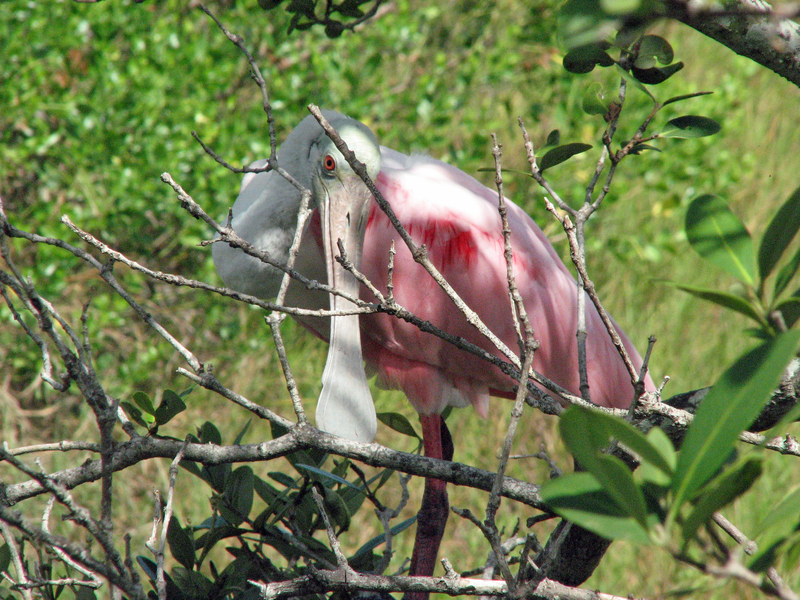 It seems that she is completely independent now, but still continues to use the nest for eating and resting. I saw her there also late last night when I checked the nest from my terrace. It seems she was sleeping there, but by morning she was gone again. Probably to get some breakfast. 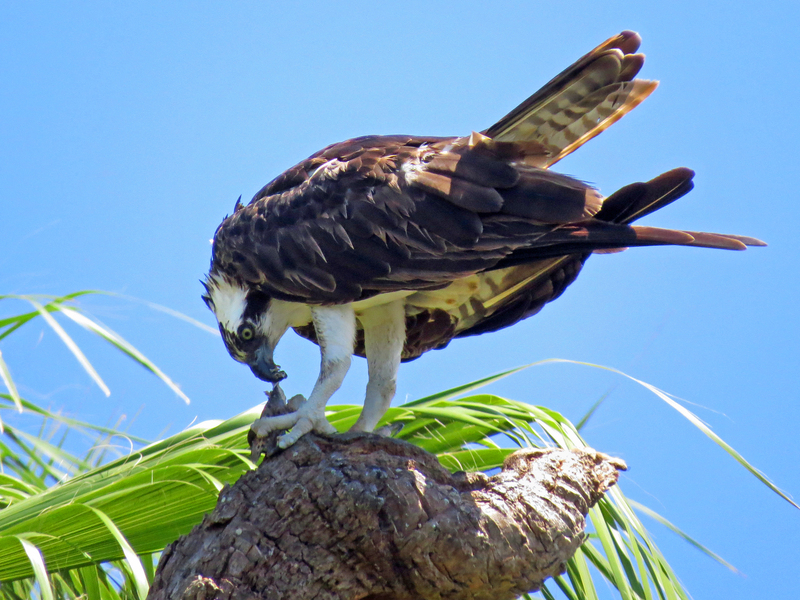 The last time I saw her there together with papa osprey was five days ago. 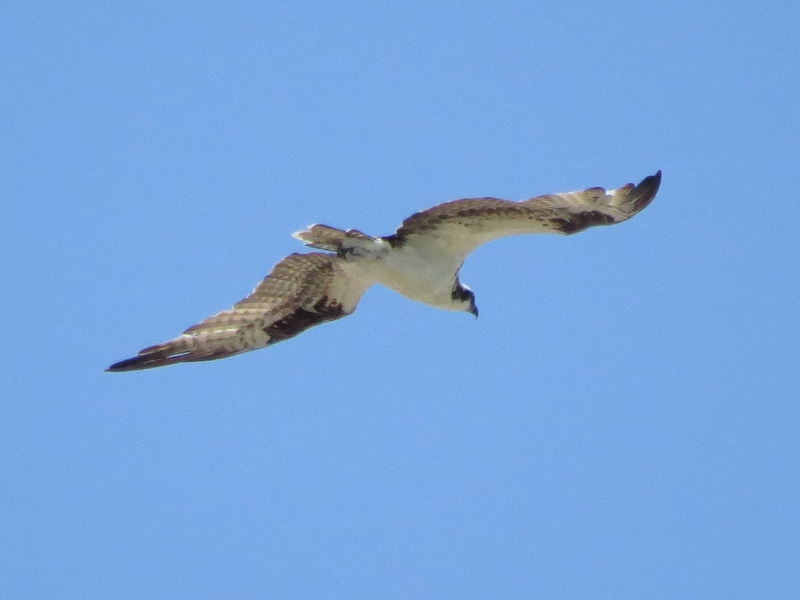 Mama osprey might have left the nesting area already (the female often leaves before the young ones are fully independent), but I’m almost sure papa osprey is still hanging around somewhere in the vicinity. Keeping an eye. As you can see the nest is becoming very “bare bones” now. 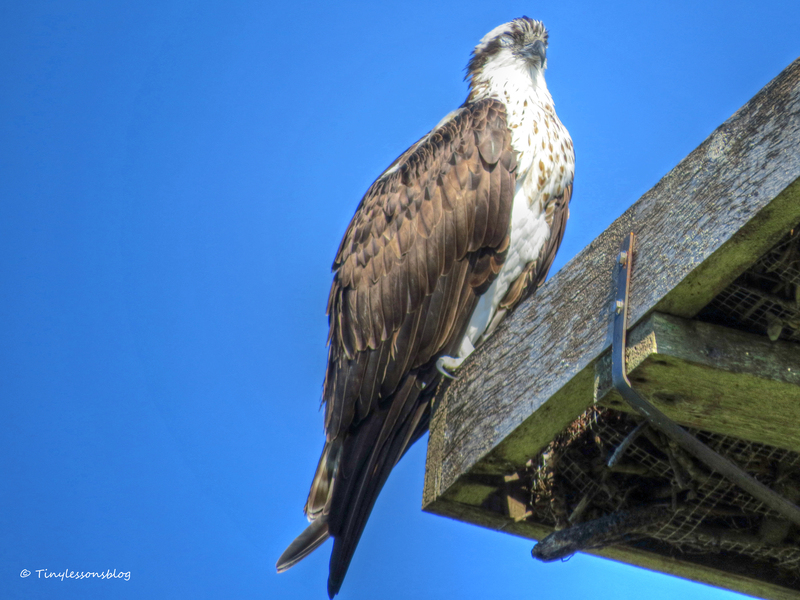 Its duty for this season is almost done…serving as a home for the osprey couple who produced one healthy offspring. And that is a great thing!